The day that you and your family have been looking forward to for months has finally arrived, and you’re happily settled in at your fabulous Sunset Beach Vacation Rental. You’ve got the perfect sunscreen for each one of your family member’s skin needs and enough water to keep everyone hydrated for at least a month. Everyone is ready to hit the beach for some much-anticipated fun. Before you head out the door to enjoy the gorgeous North Carolina beach surf and sand, take a quick minute to brush up on a few beach safety tips. All content included in this post is for informational purposes only. enjoy one of mother nature's most amazing gifts. The ocean is wonderful and alluring, and it’s only natural to want to jump in and experience its magnificence for yourself. However, some water conditions and swimming areas are safer than others. Do you know how to correctly interpret beach signs and beach flag warnings? Non-swimmers and weaker swimmers are discouraged from entering the water. Calm swimming conditions. Standard caution must still be exercised. High likelihood of animals such as jellyfish, stingrays or dangerous fish. The lack of a beach warning flag does not mean that conditions are safe for swimming. Surf/swim conditions are subject to change, and beach weather may change suddenly. No matter how strong a swimmer you are, it only takes a split second for a powerful wave to knock you off your feet or a strong undertow to pull you under the surf line. Swimming with a partner ensures that there’s someone very close by who can immediately alert people on shore if you find yourself unable to signal for assistance. If your partner was in danger, would you know how to recognize the signs of the instinctive drowning response? Rip currents are strong currents of water that can “rip” people away from shore. These currents are dangerous and can ensnare even the most experienced beach swimmer. In fact, the United States Lifesaving Association reports that more than 8 out of every 10 surf water rescues performed by their certified lifeguards are due to rip currents. To learn more about rip currents, watch this video from the National Oceanic and Atmospheric Administration. According to the Centers for Disease Control and Prevention (CDC), kids aged 1-4 are more likely to die from drowning that any other non-birth defect related cause, and death by drowning is a leading cause of unintentional death of kids aged 1-14 (second only to motor vehicle accidents). It is imperative that children of all ages be closely supervised while in or around any body of water. Can You Ace The USLA Water Safety Quiz? Did you know that the most common type of cancer is skin cancer? Melanoma is a particular type of skin cancer that accounts for a very small overall percentage of skin cancer cases but is responsible for a large number of skin cancer deaths. One of the biggest risk factors for developing melanoma is overexposure to ultraviolet (UV) radiation, such as is found in the sun’s rays. 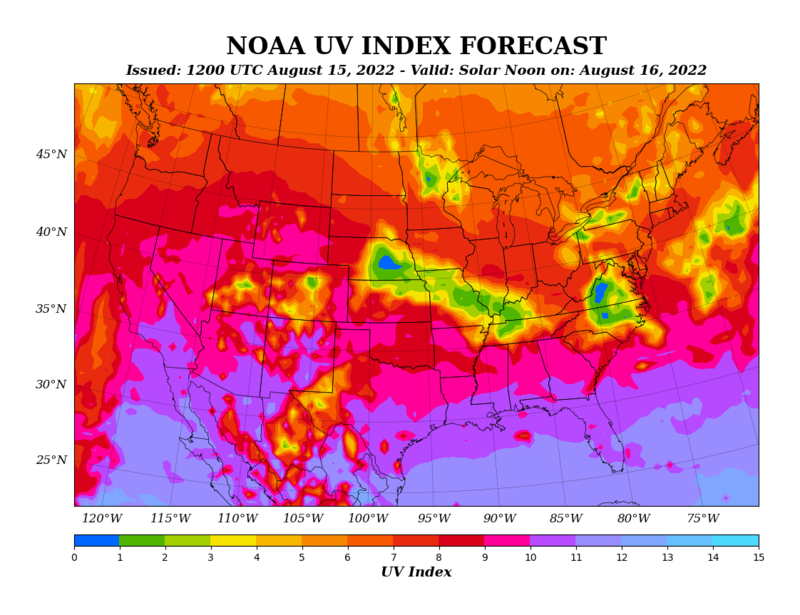 Click here for today's link to the National Weather Service’s UV forecast map. Lather up: Sunscreen should be within its expiration date and should protect against UVA and UVB radiation. Apply liberally and often, especially when engaged in water activities or when sweating. Accidentally got too much sun? Here are some tips on how to manage sunburn symptoms. Water, that is. It’s easier than you may think to get dehydrated when you’re enjoying your vacation days on the hot and sunny Sunset Beach beaches. If you notice that you’re thirstier than usual, or you get suddenly lightheaded or dizzy, you may already be suffering the symptoms of dehydration. Grab that bottle of water and some high-water content snacks such as grapes or oranges and replenish your body before you experience some of the side effects of dehydration. Planning and fulfilling a vacation takes time, energy, and a whole lot of predicting the future and hoping for the best. Most of the time, things go off without a hitch big enough to derail your plans. But sometimes the unexpected DOES happen. Travel insurance is one often underutilized tool that you can use to keep your family safe both before and during your fabulous Sunset Beach vacation. Sunset Vacations Rentals cares about your well-being, and can help you protect your family by offering travel insurance policies backed by Red Sky. For a general idea of how travel insurance can help keep your family safe, click here to watch a quick video. For a detailed conversation about your specific needs and to purchase travel insurance that is best suited to your Sunset Beach vacation, call our offices at 800-331-6428. Here at Sunset Vacations, we want you to have a fun and memorable vacation. Your health and safety are some of our top priorities. If you haven't already booked your Sunset Beach Vacation Rental, call us TODAY at 800-331-6428. No Time to Call? Click Here to Check Out Our Newest Vacation Rentals! Be sure to share it with your friends on your favorite social media platform! Search Oceanfront East Properties Now! Search Oceanfront West Properties Now!